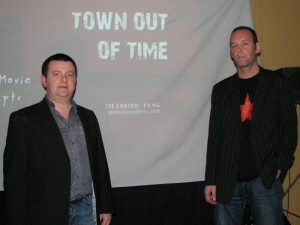 Shane’s song Youghal by The Sea has been used in a documentary made by Kieran McCarthy & Michael Twomey under the name of Town out of Time by Complete Control Films. This award winning documentary features Shane’s home of Youghal and during filming Shane was asked by filmmaker Kieran if he could use Shane’s song “Youghal by the Sea”, Shane who is a long time friend of both kieran & Michael agreed straight away. When the documentary was released it caused quite a stir among the local in Youghal as it was a documentary highlighting the recession and issues surrounding it to the town of Youghal, the social changes to Youghal town during the boom years. It looks at the doughnut effect business have on small towns and how it effects everyday life for a town center when the focus is moved outside the town center to outlaying shopping centers and business parks.